Students often hesitate over whether they should use an adverb or an adjective in a sentence. And to be honest, I did not make it much easier for them with my explanations. So I decided to buckle down to work and create a simple system which will work for my students. Here is the final result. I have created an infographic which helps the students decide what form they should use. Then there are two games to help them to practice what they have learned and an interactive quiz where they can test their knowledge. First, make sure, that your students know how to form adverbs. If they don´t, we have a great post on adverbs here. 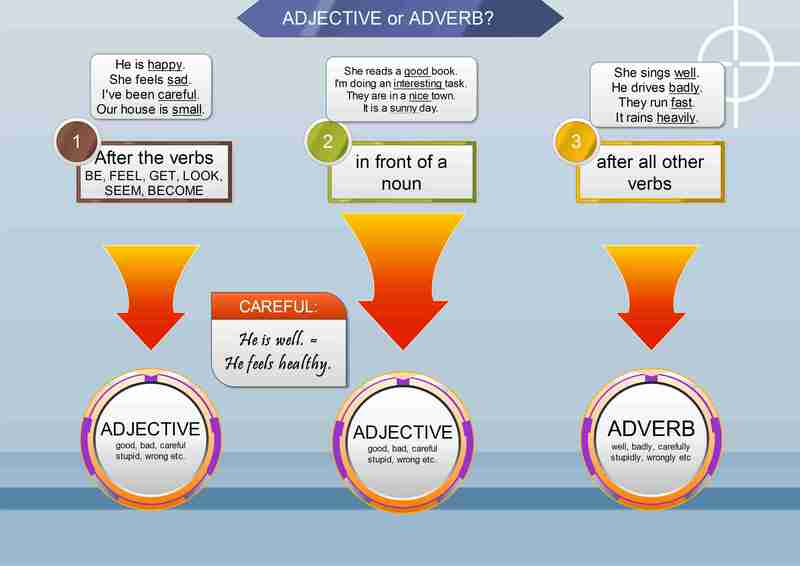 Once you are sure your students can form adverbs correctly, show them the following infographic. Explain that they have to consider two factors when deciding whether they should use an adjective or an adverb. First, are any of the verbs mentioned in point 1 in the sentence? If so, they should use an adjective. If not, they should consider point 2. Is the word in front of a noun and does it describe it? If so, they should use an adjective again. In all other cases the students should use an adverb. I know it is just a rule of thumb, but it works most of the time. You should not forget to mention that there is a difference between GOOD and WELL after the verbs in case 1. GOOD means not bad and WELL means fine or healthy. Now there are two games to practise the grammar in an enjoyable way. The first game is called On Target. Your task is to choose the correct option and then shoot all the bad ducks. You can shoot one of the bottles near the walls and thus earn a bonus. The second game is called Penalty Shootout and students love it. Your task is again to choose the correct option and then score a goal. Now you can practise the grammar in the following quiz. Students should fill in the correct answers and if they pass the quiz they will be rewarded with a game. Unlike the games above, this one is in HTML5 so it will play on all mobile devices.